I made this lotion today. I was very precise with the measurements. 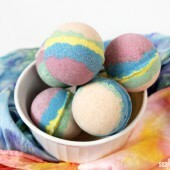 I substituted Mango butter for the Shea butter and I used Lavender essential oil. After 2 1/2 hours the lotion hadn’t thickened up much and a few hours after that I noticed it separated. I’m planning on reheating the batch for about 15 seconds or so and really mix it well. I used a hand mixer (on low) instead of a stick mixer. Is that why it didn’t blend well? and can I add a little more Stearic Acid to thicken it up? and if so, how much should I add? P.S. 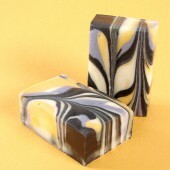 Love Bramble Berry/Soap Queen. 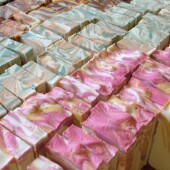 I’ve learned alot about soap making and this is my first time making the lotion. I do love it, just have a few kinks to work out. I actually have already ordered a stick blender and hopefully the next batch will come out better. I did mix the lotion for what seemed like forever today, but using only one of the attachments (less air sucked into the mixture). I have another question though, can i add goats milk powder the the lotion? Powder milk performs the same way as the liquid goat milk. Once its mixed with liquid like water, it rehydrates and shortens that shelf life to a couple weeks or so even with a preservative. Preservatives help protect against mold and bacteria, but don’t prevent milk from spoiling. We don’t recommend using liquid or powder milk in lotion. You can add other moisturizing ingredients though! 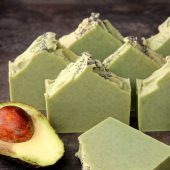 Shea and avocado butter both add a creamy, luxurious feeling to the recipe. Hello. I am about to make this wider full lotion but I was wondering a few things. Could I substitute grape seed oil for avocado oil? 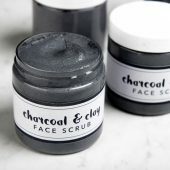 Can I make this a face cream and add tee tree oil and lavender oil for acne for my 12 year old daughter? 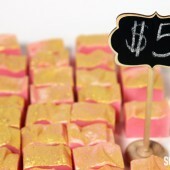 Can paraffin wax be substituted for emusilifying wax in this recipe? 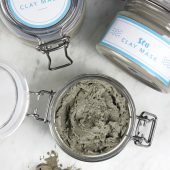 If I want to sell my homemade lotion, do I need to have it tested? Thanks. I want to make this recipe but it’s the stearic acid necessary or can I skip it. Stearic acid is not completely necessary when making lotion, but it helps give it a thicker texture and acts as a co-emulsifier. If you’d like to remove it from this recipe you can, the texture of the lotion will just be a little bit thinner :). 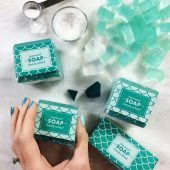 To compensate, you could increase the Emulsifying Wax a little. 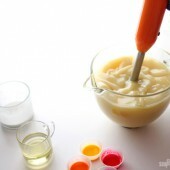 Even just an extra .2 ounces of the Emulsifying Wax will help thicken. I hope this helps Shawn, let me know if you have any more questions! 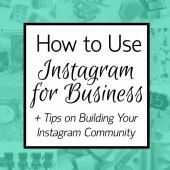 Hi, this is a great tutorial. I love your products also. 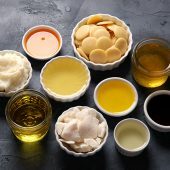 I noticed that there are many lotion makers that advocate the heat and hold method, where your oils and water/emulsifier are separately heated and held at about 150 degrees for 20 minutes. I don’t understand why that’s necessary, especially if you use a fresh bottle of distilled water, and keep your oils and butters clean and sanitary. Also, I would think it’s going to make your oils go rancid faster to heat them for 20 minutes, when everywhere else you are told to keep them cool and out of the light. If you are planning to sell lotions someday (and I know there are other hoops I will need to jump through) is BB’s method considered acceptable for selling lotion? I followed the recipe and made some wonderful lotions. It feels great as I put it on. However, halfway through rubbing it in, it began to feel like water. Did I do something wrong? 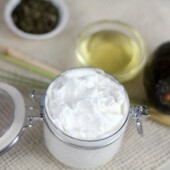 I am following Anne Marie’s lotion recipe above and I LOVE it! It makes my skin feel wonderful. The only problem is that the lotion is so thick that I can’t even squeeze it out of my bottles. Any idea what I could be doing wrong? If I added more water to thin it out I am worried that the feel of the lotion would be drastically altered- is that the case? Thank you so much for your help! Right now, the lotion is at 73.7% in this recipe. (To find that number I found out the total weight of the recipe, 24.4, and divided the water amount, 18, by 24.4). You can go up to 80% with the water in this recipe. I would recommend making a small test batch with around 76% water. If you want it thinner, you can go up from there! I am still struggling with converting the percentages into the ounces needed for the actual recipe. How can I figure out how many ounces of water I would use if I don’t know what the overall weight of the recipe will be? Is there any way you could help me with this ? I’m having problems with my lotion. I am trying to use Lavender essential oil in my lotion along with apricot oil instead of avacado oil and 2 oz of aloe verá oil. However no matter which preservative I use (Optiphen ND, Phenonip), I am getting a strong chemical smell that is overpowering the Lavender. Can you help me understand what I might be doing wrong? 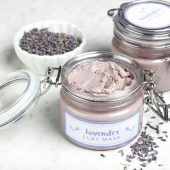 I’ve tried adding more lavender and adding preservatives when the lotion is warmer and colder and no difference. 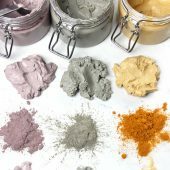 I’m using 16 oz distilled water, 2oz aloe vera, 1.7 oz almond oil, 1 oz apricot oil, 1 oz stearic acid palm, 1.2 oz emulsifying wax, 1.2 oz shea butter, .2oz optiphen, .2 oz french Lavender and Lavender matte oxide pigment. Thanks so much for the recipe! How old are your oils? If they’ve gone bad, they can give off an unpleasant smell. My Lavender oil, apricot oil and almond oil I have had the longest. I have had them for about 6 or 7 months now. Thanks so much for that information! Typically, apricot kernel oil has a shelf life of about 6 months. I’m wondering if it has gone rancid. When that happens, it usually has an odd smell to it. I think your intro is cool. I want to make a sunscreen lotion with zinc oxide (spf 15). I was wondering if you would tell me how to achieve that. 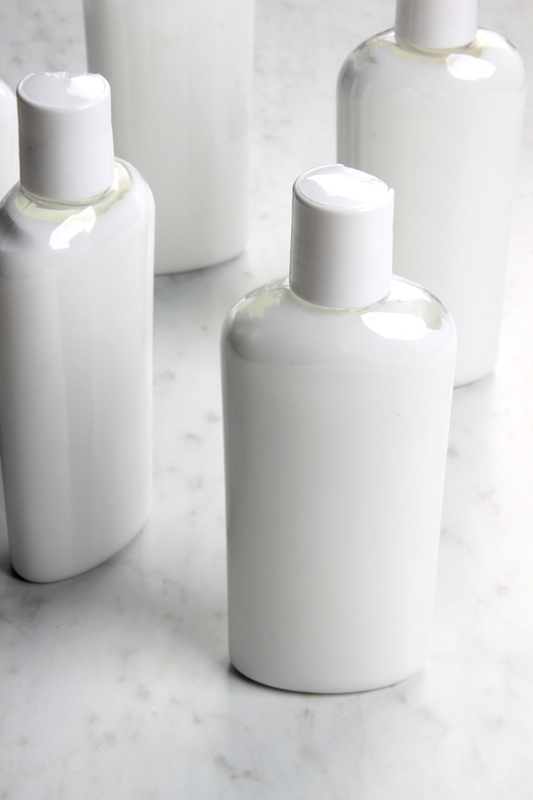 Zinc oxide is thought to have UV properties and can be added to lotion. You can add about 1 tsp. of zinc oxide per pound of lotion. To help it mix in smoothly, I would recommend mixing it with your fragrance oil beforehand, then pouring the mixture into the lotion. That will help prevent clumping. Zinc oxide is a bit heavier, so it may sink in the lotion. Make sure to mix well before each use! Zinc oxide is thought to have UV protection, but to call your product a lotion and find out the SPF level, you will need to get it tested by the FDA. I would like to add pantheon and aloe vera gel. Can you assist with the usage? 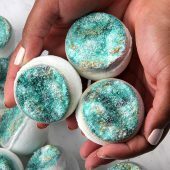 Also, since some fragrances can cause unintented consequences, is there a way to identify which Eos or FOs have this potential? My worry with the gel is it may have additives that do some odd things in lotion. I would recommend adding it around 1% and making a small test batch. That way you can see how it works in the lotion. Thanks! You guys are always helpful. I made this lotion, and I substituted olive oil for avocado oil, the first 2 days this lotion looked and felt nice and thick. Day 3 it developed a sort of “whipped” consistency, still works good but I don’t love that consistency, do you think it’s the olive oil that did it? Maybe that was not a good sub for the avocado? 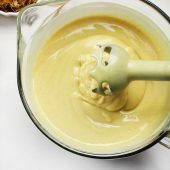 I don’t imagine it’s possible to over-whip this, I probably blended for 3 minutes w/ stick blender. Let me know what you think. I’m just a newbie, so thanks for any input you have! Yes, it was a bit bubbly, and a slight foam after it cooled. No separation. I also was able to fill like 1 (8) oz jar and I think 4 (4) oz jars and 2 small Tupperware containers, which is why I thought maybe I whipped it too much. Thanks 😄 I want to get his perfect! I’m wondering if extra air is getting into the lotion as it’s being whipped. 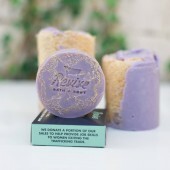 That air can make the lotion bubbly, and also create a slightly foamy texture. That extra air can get in there several ways. For instance, if your stick blender head isn’t fully submerged, it can pull air in. We recommend using a tall container so the head of the blender is covered by lotion. Also, make sure to tap the stick blender on the bottom of your bowl before pulsing to release any air trapped underneath. It can also be that the stick blender isn’t working too well. If that’s the case, you may contact the manufacturer to find out about warranty options! Could I use avocado butter or mango butter in this recipe? Would it feel the same? I LOVE this lotion but am out of Shea butter. Ok, this prompts a question, I do have refined Shea butter from Whole Foods that is a hard Shea butter, unlike what I get from Brambleberry, would this be ok to use or do I have to heat it? Please advise. You can use any of those in your lotion! 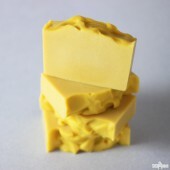 Each butter will give the lotion a slightly different feel. For instance, the harder shea butter will give the lotion a bit more structure. 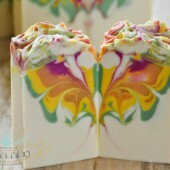 Mango butter is also firm, so it will have a similar effect as the harder shea butter. 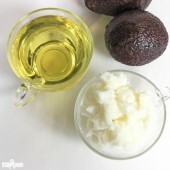 Avocado butter is fairly soft, so it will change that lotion texture and make it a bit softer. Hi there! 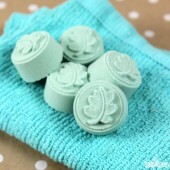 Could I use BTMS-50 instead of the emulsifying wax? 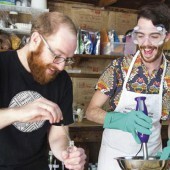 Would I use the same amount of BTMS-50 as I would the emulsifying wax? What is the expiration date for this recipe (and what does that mean)? What are the guidelines for this or where can I find this info? I have been filling my lotion bottles while the mixture is still pretty hot (about 135 or so) and never had seperation problems. I just had a fellow lotion maker tell me that I need to stir the mixture (after blending) until it’s room temp before filling my bottles in order for the lotion to remain stable. Have you found this to be the case? I use Optiphen if that makes any difference. We typically pour our lotion when it’s on the warmer side! To ensure your lotion stays together, make sure to stick blend well. What I like to do is stick blend, then let the lotion sit for 5 minutes. If the lotion starts to separate, blend for another 1-2 minutes. That should keep it emulsified, even at higher temperatures! Hi! Can i add raw honey to the recipe? Like an additive or as percentage of vegetable oils? Thank you! 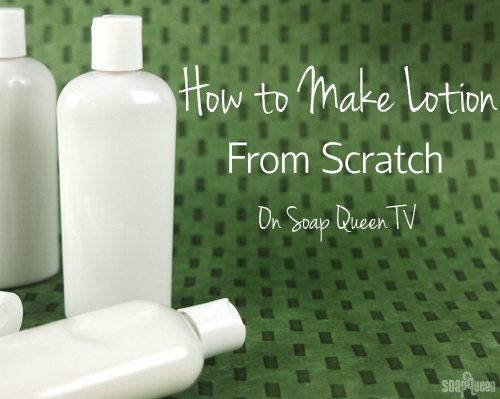 I’ve made many batches of this lotion and have always been successful up until yesterday! I made four(4) different batches using the same recipe and method! ONE of the four batches separated on me! 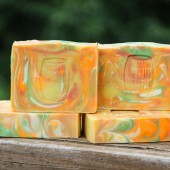 The only difference between that batch and the others was the FRAGRANCE OIL USED! Is it possible that the fragrance oil is the culprit? Is there anything I can do to fix this, as I really do like the fragrance! Thanks! Because that one batch was the only one acting up, I’m thinking it may be the fragrance oil. Certain fragrance oils can do some weird things in lotion, and I’m thinking that may be one of them. I would recommend making another small test batch with that fragrance and seeing if the same thing happens. If so, it may just not like lotion and a different fragrance may be a better option. I’ve finally succeeded in making lotion from scratch! Yay! The first time I tried it failed, and ended up separating and had pools of oils everywhere. It also smelled terrible, not quite sure how that happened. I tried again today, and succeeded! 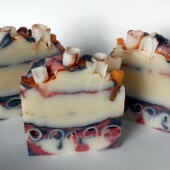 I used cocoa butter and cinnamon bark essential oil to scent it, and it is really great! It worked! I’m super pleased right now 🙂 This site has been super helpful to learn about making lotion! Thanks so much! Thank you for the video. Where can I purchase the stick bender, balance scale and Thermometer that you used in this video? Thank you. I’m afraid I’ve tried this three times and failed! It emulsifies perfectly and then when the Phenonip is added it splits slightly but comes back together. The instant the fragrance is added it splits and will NOT come back. I’m using a Parma Violet fragrance. Is that the problem. 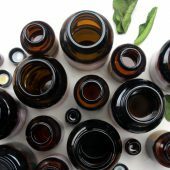 Too much of it or just that only essential oils can be used? 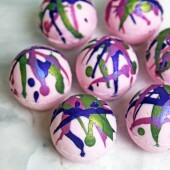 One of my earlier disasters came with using a coloured dye in the water. That seemed to have killed it too. Most diappointed in myself as it looks great to that point. 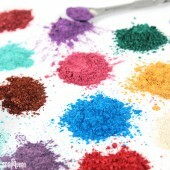 After you add the fragrance and preservative, you can stick blend for a couple more minutes! That will ensure everything mixes in well and that lotion is emulsified. I have two questions about lotions. 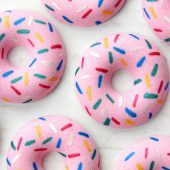 1- can I make larger batches by simply doubling the recipe? 2- is there any product I can use that would have a shimmering effect on the skin? Thanks so much! Cannot wait to start adding some mica!! 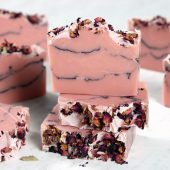 I would like to make this but I would like to replace the water with aloe very juice and want it to be the same consistency of the aloe lotion base. I noticed that with all of the recipes with aloe very juice that optiphen was the preservative and not phenonip. Is their a specific reason why? I purchased the lotion kit from the brambleberry website that includes the “How to Make Lotion” PDF booklet. 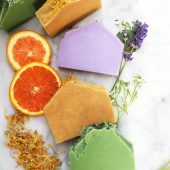 In the instructions for creating personalized lotion recipes it suggests adding things like glycerin, aloe vera gel, liquid silk, and Vitamin E. Are the percentages added in addition to the oil and butters or subtracted from them? For example, if I wanted to add one of these would by total be 100% regular recipe ingredients + 2% preservative and FO + 2% say aloe vera gel = 104%? 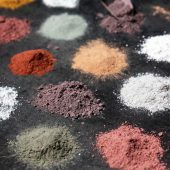 Also, if I am using powdered oxide colorants instead of liquid, how and when do I add them? 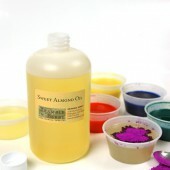 Ingredients like liquid silk, fragrance oil and extracts are added in small amounts and considered additives. That mean they are not added in the total recipe, but rather in addition to it. What is the temperature of the water and the oils when you were just about to mix them? Should they be at the same temperature when attempting the emulsification? Heating and holding your ingredients is an optional step you can do if you’d like. Some people do that method to kill any bacteria or microbes. We’ve found disinfecting the equipment beforehand works well for us, but you can do that step to be extra careful! Hi, love this recipe! Just wondering if I could add my favorite perfume instead of the essential/fragrance oil? Thank you. So glad you love the recipe! We don’t recommend adding perfume to this recipe. Most perfumes are mixed with alcohol, which can do weird things to your lotion. If you do give it a try, I would recommend making a small test batch to see how it performs. I made this yesterday, my first lotion attempt. The first time it was great! I felt it was a little too thick and a little greasy do my second attempt I added one more ounce of water and then added 2 tsp. 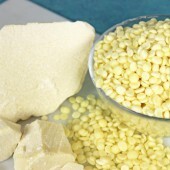 of tapioca powder to the hot water before adding it to the oil and wax. First, the powder didn’t play well with the water, there were some lumps and a bit sticking on the sides. I added it anyway to see what would happen. Well, the lotion never thickened and it got sort of foamy on top no matter how much I stick blended. Finally I just called it an epic fail and chucked it. So how/when do you add tapioca to a lotion and how much? I made the lotion that was shown on the How to make lotion from scratch video. What adjustments do I need to make if I want it a bit thicker. I added more emulsifying wax and got the texture that I wanted but now the lotion doesn’t glide after applying to the skin and it seems like I have to rub it hard in order for my skin to absorb it. Also do you have a recipe for a basic thick lotion. Thanks. To make this lotion a bit thicker, you can decrease the amount of water you add! I would recommend decreasing the water amount by an ounce or two. You can always decrease it more if you want it even thicker! 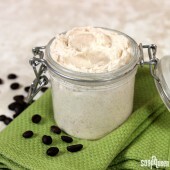 Also, we have an awesome recipe for body butter you may like! Because it’s comprised of just oil and butter, it’s very thick and luxurious! 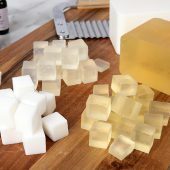 Is there a recommended usage rate for Glycerin and if so when should I add it to the recipe? I’m making it from the lotion from scratch video, thanks. 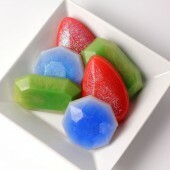 You can use glycerin in your recipe at a rate of about 3-5%. You can add the glycerin to your distilled water, then add the oils and stick blend! I’m really looking forward to making this – my plan is to develop an insect repellent which can spray on so I will need to add more water, at what stage should I add more water? Also would I be able to replace the sweet almond oil with wheatgerm oil do you think? Or perhaps go halvers with the sweet almond oil to prevent the smell of the wheatgerm being too strong? And is Vitamin E an OK preservative to use? I love this lotion recipe… I do have a question about it though I fallowed the recipe the way you have it and put it in bottles but after is sat it got very thick and hard to get out of my bottles almost like a thick body cream or body butter rather then a lotion… Is there a way to use this recipe but thin it out just a bit? I didn’t know if I could add something or reduce something to get it to a more fluid consistency with out changing the quality… One thing I love and my customers love it it doesn’t leave a greasy feel like other name brand lotions. So glad you love the recipe! If it’s a little to thick for your preference, you can add more water to thin it out. I would recommend starting out with an extra couple of ounces. Also, a small test batch may be helpful because it can help you get the perfect consistency! I just made this lotion and it’s AMAZING!!! If I wanted to add colloidal oatmeal to it, would I need to change the recipe? You can add about 1 tsp. of oatmeal per pound of lotion. I would recommend adding that oatmeal to your oils, or right before stick blending. That way it mixes in well and doesn’t clump! 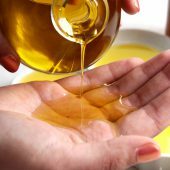 I am so excited finding this clear and well explained video, it has inspired me more (was getting skeptical) for my new social venture of making natural skincare and hair range especially soaps, body creams and lotions with primary focus on helping manage different skin conditions working neem and other healing natural African oil. Thanks so much, I will for sure. I purchased you lotion kit and I have a recipe for lotion with out preservatives. How much preservatives would I add to the following recipe. I love the recipe but I can’t risk mold growing. 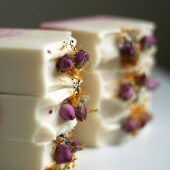 I would like to substitute the oils and have instead Shea Butter, Safflower Oil, Meadowfoam Oil. Would this affect the amount of phenonip and emulsifying fax? Do you sell meadowfoam oil and safflower oil. Thank you so much Kelsey for responding. I made this according to the recipe and love it! But after about a week I noticed it seemed a little grainy like maybe the shea butter was solidifying? My house stays cool….around 65 degrees. As soon as I rub it in the teeny lumps melt. Has anyone else had this problem? How can I avoid it? With your lotion now, it may help to heat it very gently in the microwave on 30-second bursts for just about a minute or two. Then, stick blend the mixture. That may help remove the graininess. If not, the lotion is still totally fine to use! That is the method I used to melt my shea butter. I will try heating the lotion and blending it again. Thanks for your reply. Can some of the water be replaced with goat’s milk. If so, what should be the percentage of water and goat milk, and does this affect the amount of preservative or oil used? You can replace some of the water if you like! You can keep the same preservative amount for this recipe. Keep in mind, adding the goat milk will shorten the shelf life of the lotion, even with a preservative. If you’re using 100% goat milk in your recipe the lotion will last about 6 weeks, maybe a little longer in the fridge. However, if you’re only using 10% goat milk in your lotion recipe it will probably last about 6-9 months. What if I did half water Half milk? Would I keep the same amount of preservative and would this work for any lotion recipe? My mom purchases goat milk lotion and they said it would last one year. I’m trying to figure out how they can get it to last so long with the milk any help would be appreciated. Thanks! Half water and half milk would last about three months or so. Also, you can use the same amount of preservative. Preservatives help prevent mold and bacteria, but they don’t extend the shelf life of milk. I have been using Peach Fragrance Oil from a local supplier. Do you think the Fragrance may be the culprit? I re-used that fragrance oil in the batch with 17oz of water and that lotion is holding really well. I am thinking the water content needs to cut back…but let me know your thoughts. 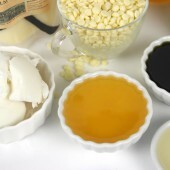 Some fragrance oils can be tricky in lotion. I would recommend contacting the manufacturer to find out more. 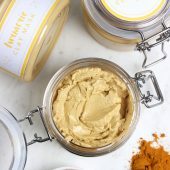 Hi Anne-Marie/Brambleberry, I have bought the lotion kit and made this lotion exactly as the recipe stated, with the exact type and quantity of ingredients. The lotion is super nice! However I’ve noticed after some times, lets say a couple of months, one of my earlier batches started to separate, in that i started to see a watery-looking layer starting to form at the bottom of my lotion bottles, and the lotion sort-of “floating” on it. This week I tried the recipe again, and did the exact same ingredients and quantities and the lotion was very runny, not thickening. I left it for a while to find the same separation happening, this time not in months, but in hours. I am selling this lotion and cant afford this to happen to my customers! I noticed too that I had a lot of air bubbles in the mixture this week…..I put the exact 1.2oz of emulsifier from BB in the lotion, and I am not sure why its separating, if not right away, then why is it separating months later? Am i doing something wrong? Please Help! It sounds like your lotion may need a bit more stick blending. It can take a good amount to get it to fully emulsify. I would recommend pouring your lotion into a bowl and stick blending for another 5 minutes or so. Hi Kesley, Thanks for replying! That batch of lotion that separated, I’ve put it aside covered under plastic wrap on my table. I haven’t touched it since about 2 days ago. It has separated a great deal over those 2 days. Would it be possible to go back and stick blend this batch of lotion, even though it was made 2 days ago? If the lotion starts to emulsify now…would it separate again later on? Can the water content be the culprit? I put the 18oz as the recipe recommended….has anyone else ever encountered this? Hi Kelsey, I’ve stick-blended the lotion after letting it sit for 2-3 days. It did start tot thicken a bit during the blending process. I let it sit for a while overnight and to my dismay the lotion started to separate again this morning. it seems the solution did not work. Can the water content be the culprit? I made another batch an insteaad of putting 18oz of water, I put 17oz and the lotion thickened like “jello”, to a really good consistency. Please let me know if there is anyhting else I can do to that batch of deflated lotion. Hmm, that’s strange! We haven’t experienced any separation with this lotion. What fragrance oil are you using? 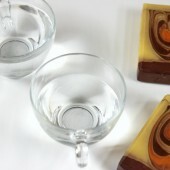 Sometimes fragrance oils are harder to incorporate than others. Is the stearic acid in this recipe added for the purpose of an (co) emulsifier or a thickener? I made it this weekend. It is a wonderful recipe, much nicer than the other recipes I made. I did not know that the stearic acid created fluffiness, thanks for the advice. 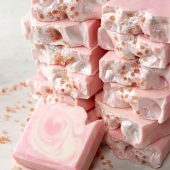 I’m new to this lotion and soap making but if i dont have phenonip on hand can i use germall plus with this same formula? as my preservative. So far, everything has gone well with my recipe. My question is, what is the shelf life of gm lotion with a preservative added? 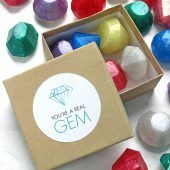 Hi, Im starting a business at school with some friends and one friend really wants to do lotions (which I agree with)so do you have any advice for us? 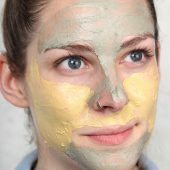 I know carrier oils are good for the skin (not olive oil though) but I really need advice. 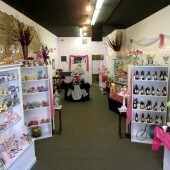 We’re really excited to order from BrambleBerry once we have enough money to pay for the stuff. 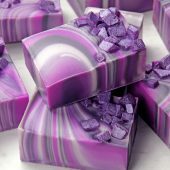 I’m new in soap making (really new, haven’t made anything yet) but I love your videos and I have watched a LOT of them. Any advice for me on that? 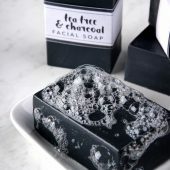 Im saving water bottles for soap molds until we can afford some. The basic lotion formula is 70-80% distilled water, 3-5% stearic acid, 3-6% emulsifying wax, .5-1% preservative and .5% fragrance. The rest of your recipe are your choice of oils and butters. When it comes to choosing butters, it’s completely personal preference! 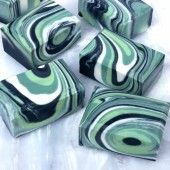 Avocado oil and butter, sweet almond oil and rice bran oil add great moisturizing properties. If you want a less oily lotion, we also have an oil-free version you may like! 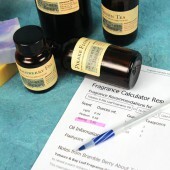 Can I just add fragrance oil without the essential oil? If so do I still use 1 oz? Or 2oz to take the place of EO ? Thank you! You can just add a fragrance oil of your choice! It’s fun to customize. The recipe listed above is larger quantity can you tell me how much water to use it’s a bit different recipe than the video as far as percentages of each ingredient. Thanks. The ingredients listed above are what comes in our Lotions Kit, they are not the recipe. So sorry about any confusion! 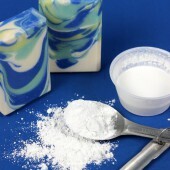 Also, there is a great post on TeachSoap.com about lotion making. 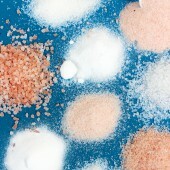 It includes a basic lotion-making formula that tells you what percentage of each ingredient to use. I’ll include a link! Could a pump be used for this recipe? Thanks. If I choose to use optiphen in place of phenonip will I still only use 1 oz.? Should I expect any changes by altering this one ingredient? 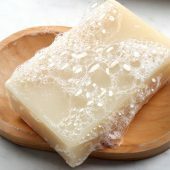 I substituted Sweet almond oil for grape seed and I accidentally used bees wax instead of emulsifying wax, can I remelt. It and still use it? 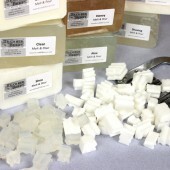 Emulsifying wax ensures that the oils and water mix together to form lotion. Beeswax does not do that, meaning your lotion will separate. I have BUBBLES from the stick blender. I followed the recipe to make 4 6-oz bottles…and I probably have 2x that amount. It is probably all air and will be gone tomorrow….but what if it isn’t? Do I need to switch to a handheld mixer? IF the air leaves tomorrow, and my bottles will then be 1/2 full, can I heat it up to fill up the rest of the bottle? It sounds like there is some extra air in that recipe. You may try pouring your lotion back into a container and gently folding it. That may help get rid of some of those air bubbles. What do you mean: Gently Folding it? I am new to this recipe and I am about to start making it but I have never heard what you mentioned above. I just noticed I missed this comment. I’m so sorry for the late reply. I have read in a lotion making book, that the water and oils should be heated and held for 20 minutes. Do you find this to be true? I have not been brave enough yet to make lotion for fear that something will grow in it. And the book I read turned me off from making lotions because of all the many steps involved. This seems way easier than the book I read. Also do we have to challenge test before selling any type of water based lotions? 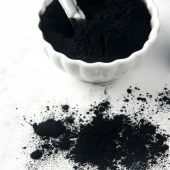 The heat and hold technique is an extra, optional step to really ensure that there are no icky things in your ingredients. You can do it with this recipe if you’d like, or you can just disinfect with the bleach water. What you do is you heat your water and your oils (separately) to 160F and hold them at that temperature for 20 minutes (do not include your preservative or fragrance in this process). You will need a double boiler or a water jacket tureen. Then, make your lotion like normal. 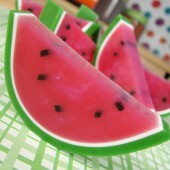 I used this recipe but used optiphen plus as the preservative. I waited until it was 120 degrees to add it. The lotion was well blended and thick until I added the preservative. Now it’s a watery consistency and has not thickened again. I saw in a different post that optiphen plus needs to have all the oils etc under 100 degrees to work. My question is this: can I still use the concoction like this or do I need to throw it out? 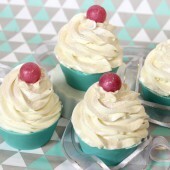 Thanks Ann-Marie…I haven’t made this recipe but I did the kissably soft one and love it. Although I find I have to mix it for 10-15 min to make sure it stays together. When I’ve only just mixed it, I find its runny. Is it maybe that I’m heating the oils too high? This is by far the best lotion recipe. I have tried others and also varying the ingredients but always come back to this. My customers love it. Thanks for doing a lotion video! I’ve done a body butter but haven’t ventured to the lotion. I now feel confident I can do it!